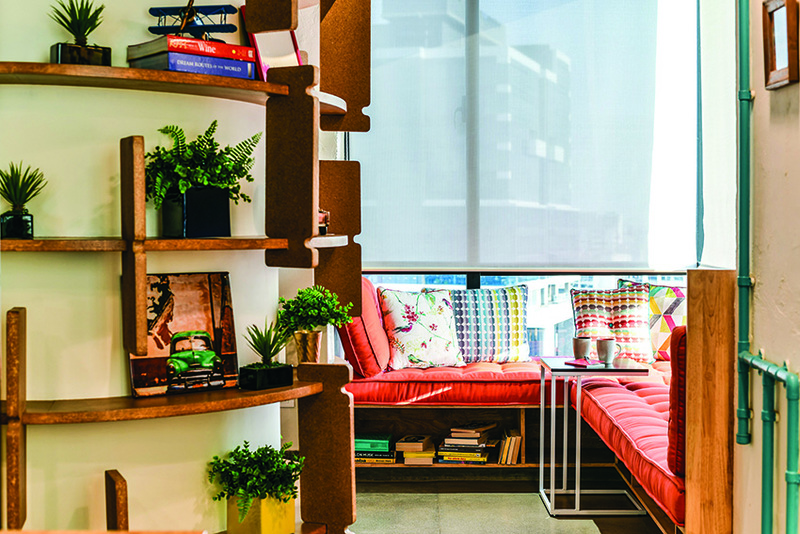 Taking a break from hospitality projects, interior designer Minnie Bhatt turns her attention to a media office — And Beyond Media — in Mumbai. 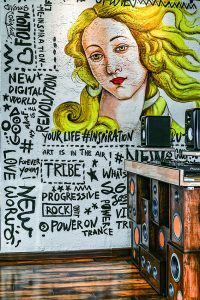 While quirky and energetic, as one would expect of a workspace in such a creative industry, it showcases a definite, individualistic personality that sets it apart. 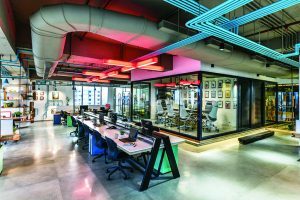 Envisioned as a vibrant, quirky, unconventional and inviting space, the And Beyond Media office is a haven for creatively-inclined individuals. 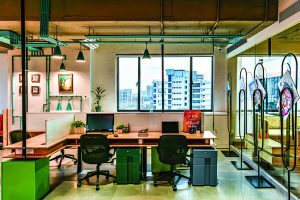 How often do you come across an office space that is bathed in natural light and is spacious despite its dense programme, especially in a city like Mumbai? 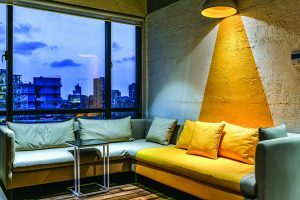 The new office of And Beyond Media, located in the packed suburb of Andheri, is one such pleasant aberration. It’s the kind of space you’d look forward to heading to despite the manic traffic or Monday blues. And the person responsible for such an inspiring space? 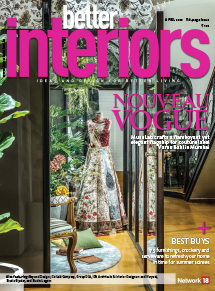 None other than interior designer Minnie Bhatt who heads Mumbai-based Minnie Bhatt Designs. Though Minnie is known for her hospitality projects, she has proved that her passion for good design can encompass diverse programs. “We have designed close to 50 restaurants and bars, and wanted to explore projects in other sectors too. 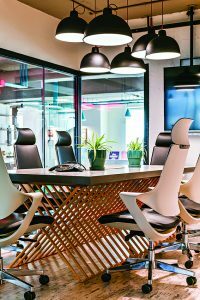 We had worked on a corporate office almost two years ago and this project came across as an unconventional and younger space, which is what interested and prompted us to take it up,” shares the designer. 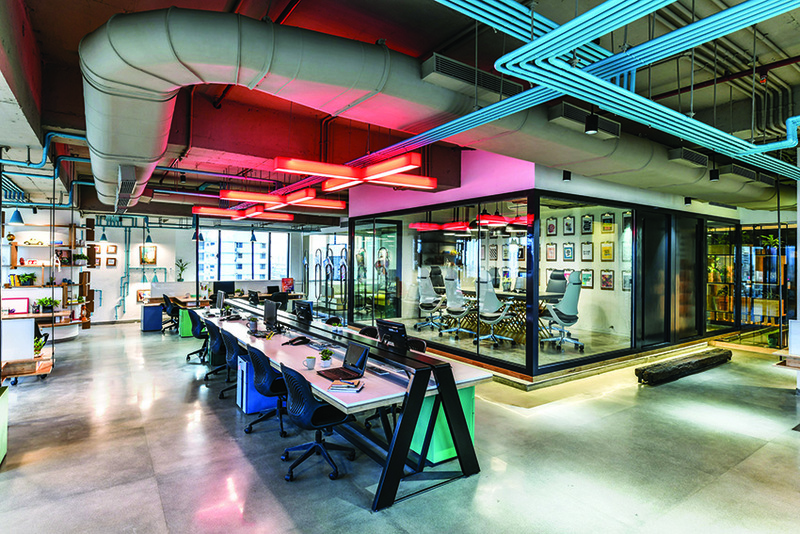 The work area is marked by three zones; a large workstation in the center, suspended desks at the periphery and another set towards either end of the large space. 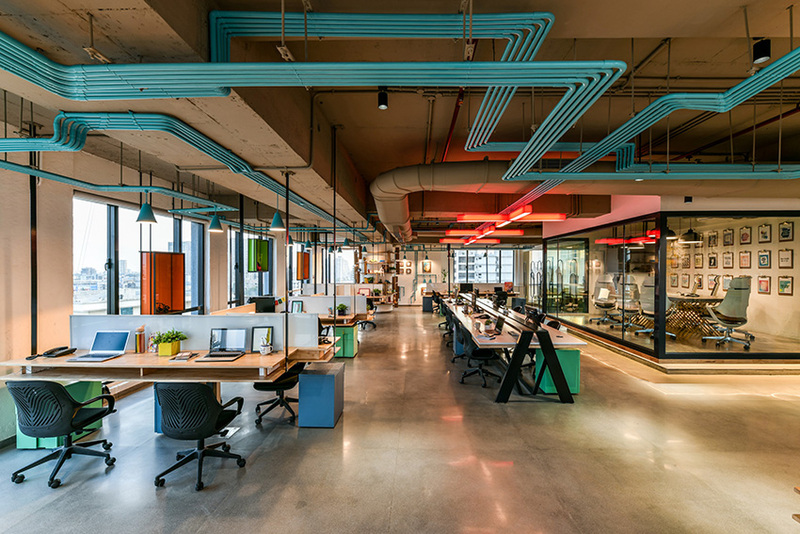 Vibrant, quirky, unconventional and inviting — these were the parameters set by the client for their new workspace. For a media office, such a design brief is, in fact, de rigeuer, making the task at hand even more challenging. The space needed to be distinctive without being imitative, quirky but not predictable or kitschy, and inviting without compromising on practicality. In response, Minnie decided to follow “no particular genre,” instead choosing to sync bright colours — adventurously, we may add — with warm wooden tones and raw cement to create a contemporary space that is full of surprises. Not part of the original layout, this corner space evolved during the spatial planning to provide for an inviting nook for employees to chat, read or just relax. From the moment you step into the office, you appreciate the airy and capacious vibe. The elevators open into the reception, which has two doors on either side, one leading to the breakout area and the other into the workspace. A metal and wood planter, acting as a partition, screens the main work zone and looks alluring bathed in filtered sunlight. On entering the workspace, you find the meeting rooms placed to the right and washrooms to the left. A glass divider separates it from the breakout area, which has an indoor and outdoor section. 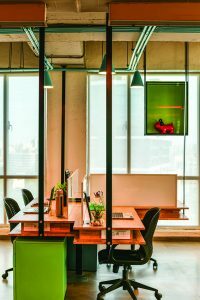 The work zone has three sections: a large community workstation in the middle, suspended workstations towards the glazing and another style of workstations at either end of the space. “The workstations are greater in number than currently required keeping in mind the company’s expansion plans,” Minnie explains. 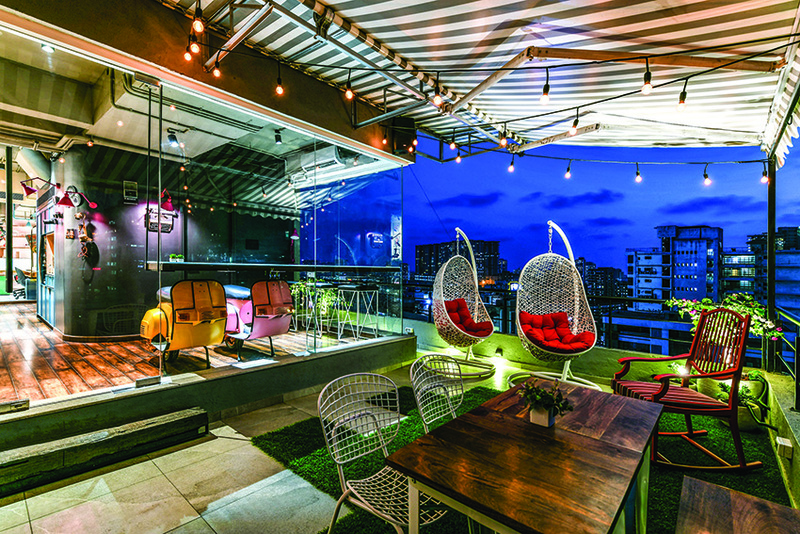 An extension to the break-out area: A patio-style ambience is created with a rocking chair, swing chairs and dining tables. Created according to the designer’s specifications, the plus-sign light fixture on the ceiling symbolizes ‘more’ and has an intentional graphic-like appeal. 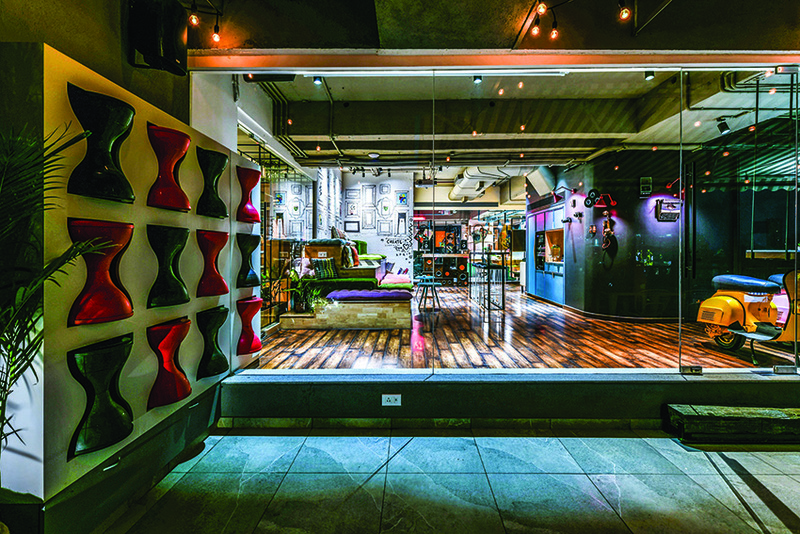 As for quirk, there’s plenty of it: turquoise pipes act as old-fashioned electrical conduits near the workstations, whimsical wall art at almost every corner lends a friendly vibe, scooter seating in the dining area and an amphitheater-style breakout space makes for interesting social spots. There’s even a small DJ console for the CEO when he switches his role to a DJ on weekends! With red and black stools arranged in a plywood box, the stacking unit appears like a wall art in the outdoor section. 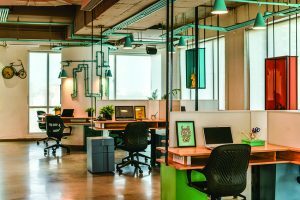 Between the workspace and the recreational zone, there is a fine balance between work and play. Both generously proportioned and both intrinsic to the work culture at And Beyond Media. Minnie has used her hospitality design background to her advantage, while also being cautious about it. We notice that she has shown prudence in design where needed (evident in the sleek but inviting workspace) and exaggerated the design where it was called for (elaborate wall details and highlights). 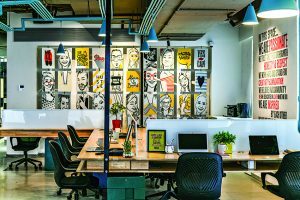 Not all modern office can mitigate the Monday to Friday grind with its design but And Beyond Media definitely makes a worthwhile attempt at it — and most likely succeeds too. 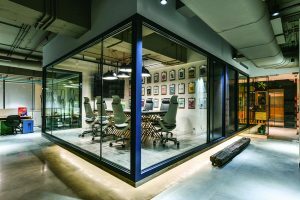 An unconventional office space that follows “no particular genre” but still creates a harmonious atmosphere where creativity and productivity can thrive. Adjacent to the reception and overlooking the work area, the floating conference room is marked by refined aesthetics. The clip boards on the wall display a handpicked selection of posters and photos from various clients. Suspended workstations makes the office appear more spacious and allow natural light to flood the entire floor. 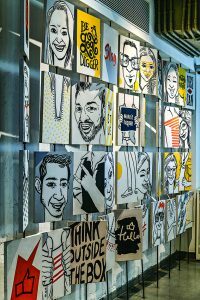 Conceptualized by the design team, the graphic wall in the main work space includes caricatures of the directors of the company and members of its staff. A cosy working area at the other end of the hall: Note how the colour palette, while diverging from the media house’s brand coloursof yellow and purple, perfectly matches the youthful environment of the office. 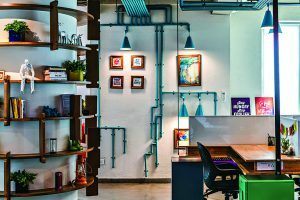 There is a hint of childhood bliss in the jigsaw puzzle-inspired shelf (on the left), and the maze-like turquoise pipes in the midst of the office space. 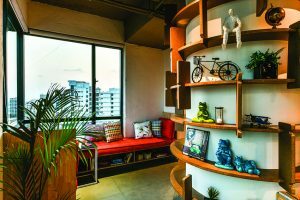 The wrapped shelf which holds books, planters and interesting knock-knacks aesthetically transforms theotherwise unsightly column and gives it a practical use. The cork board shelves are inspired by jigsaw puzzles, which is evident in the well-defined joinery of the boards. 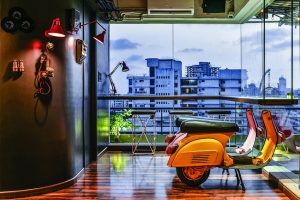 An informal nook where employees can chat, eat or simply relax on the scooters that were sourced and painted to form seats. This overlooks the outdoor breakout zone. A compact unit, as opposed to a room, functions as the pantry and sits well in the breakout space next to the TV lounge. 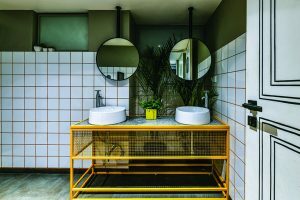 Mimicking a subway restroom, the washrooms are fitted with a powder-coated mild steel unit and circular mirrors — both customized for the project. 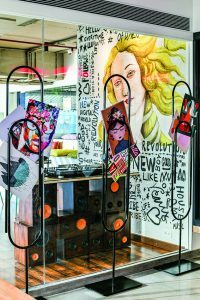 Clear glass divides the workspace from the breakout area.The‘u-pin’ magazine holder serves as both a visual divider and art installation. Used occasionally by the team for internal meetings, this amphitheatre seating in the breakout space was created with wooden finger boards, artificial turf and painted plywood. The DJ console is created with faux audio speakers and serves as a spot to encourage the CEO’s passion for music. Sharing a common wall with the reception area, the indoor breakout space gives a sneak peak into the fun work environment. 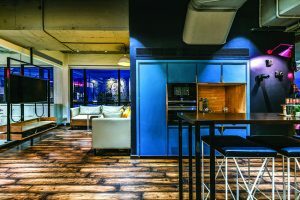 Details like the industrial surface finish, home-like lounge setting, and a fun ‘spotlight’ all exemplify the architect’s design concept which was formed to deliberately follow“no particular genre”. Minnie wanted to create atypical work desks that would be inviting as opposed to rigid and modular. 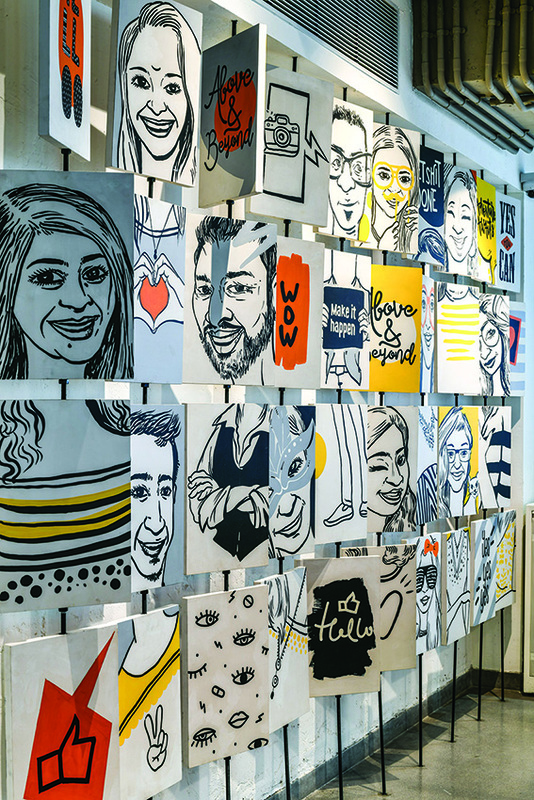 An interactive wall with spinning boards highlights the personalities of the office members and makes for a great icebreaker. The restrooms could not be relocated in the new design, but were nevertheless givena quirky upgrade. 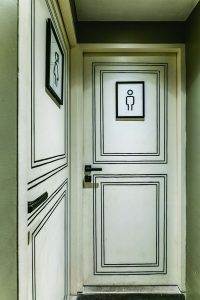 Note the simple but interesting representations for genders marked on the doors. The intriguing conference table was custom-designed with a cement sheet tabletop and mild steel rods that are powder-coated in yellow. 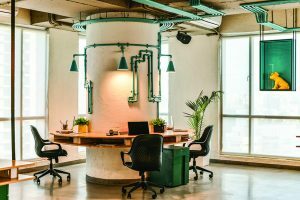 Functional and artistic with an industrial touch, the turquoise-hued exposed pipeswhichrun across the workspace hold the wires for the conical overhead lighting.